My beautiful intelligent Mother was diagnosed in her 60’s. She passed away from this cruel disease 10 years later. Some of her siblings also had Alzheimer’s. The end of this story is that I have a strong family history of Alzheimer’s. I walk for my Mother who was taken away too early. I was diagnosed with mild cognitive impairment (MCI) last year and my condition has progressively gotten worse, along with my test scores. When we talk of the 7 Stages of Alzheimer’s I’m at a 3. I will walk to raise awareness and money for research not only for myself but to eliminate what our Care Partners and family are going through now and what they will go through in the future. I have been there with my Mother and now I am my Mother. My mother died with Alzheimer’s disease (AD) in 1999 after many difficult years. 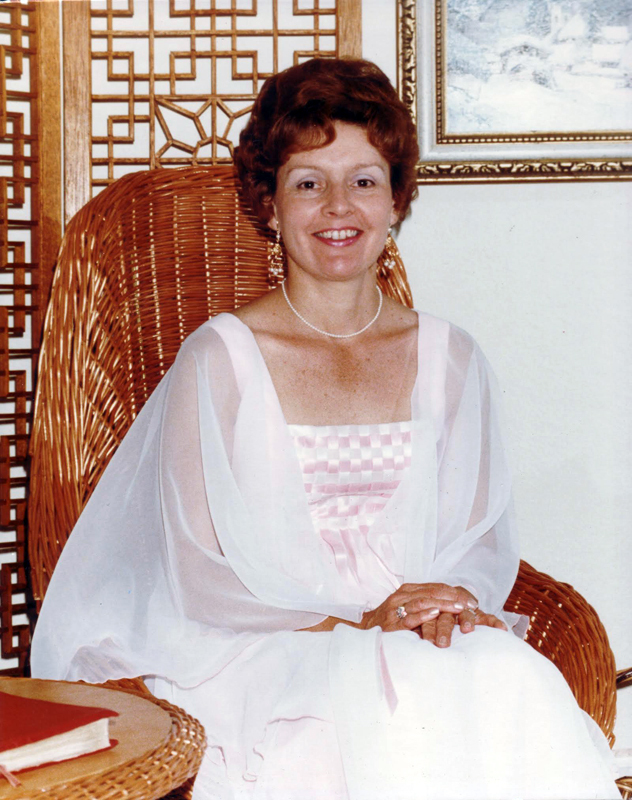 My mother-in-law also died with Alzheimer’s in 1989 after 12 years of decline. Mary, then my wife of 48 years, was diagnosed with Alzheimer’s in Sep of 2001. What had been a wonderful life together became a nightmare. It was like starting life all over again, but with different rules. Dealing with numerous doctors, tests, medications, and Mary’s loss of ability to do even ordinary things and exploding with unheard-of behaviors turned life upside down. It was devastating to Mary, physically demanding and expensive – Alzheimer’s disease ended a wonderful life. This beautiful, talented, gracious, special lady just wasted away. Worse, perhaps, was the knowledge that 100 years after Dr. Alois Alzheimer defined Alzheimer’s disease there was and is no cure – nothing that even slows Alzheimer’s or helps much. It’s like falling into a bottomless pit with no escape. 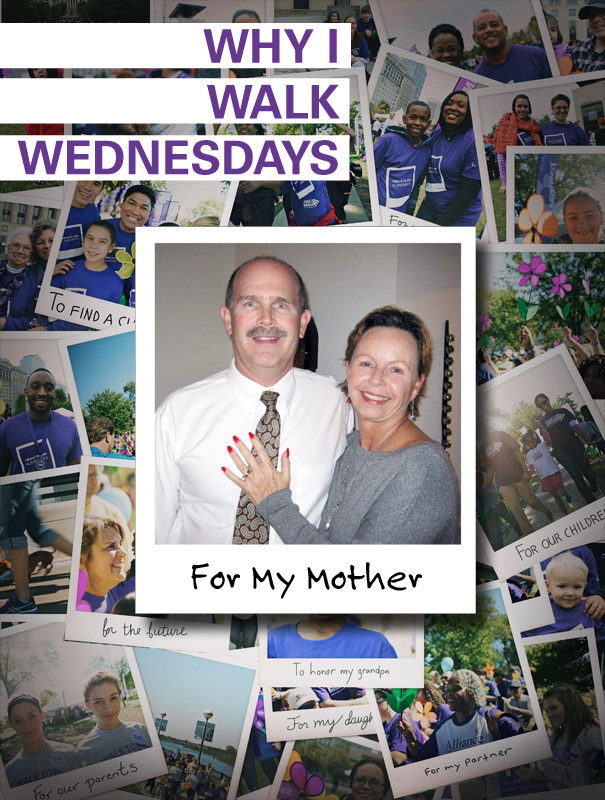 I walk to raise funds to find a cure and to raise awareness of this awful disease. I Walk to End Alzheimer’s. I walk because “One Day There Will Be A Cure”. 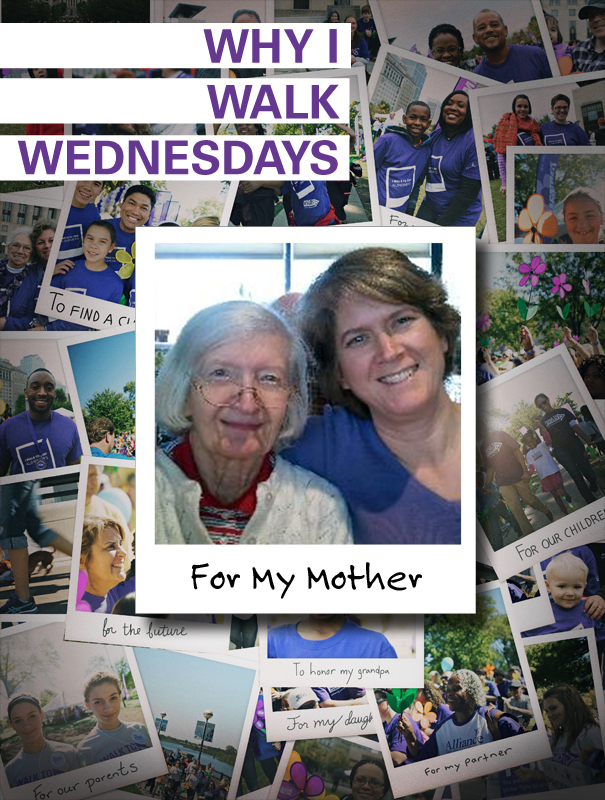 I walk to honor my mother who has sacrificed seven years to this disease. I walk to raise awareness of Alzheimer’s and to encourage people to speak more freely about this disease. 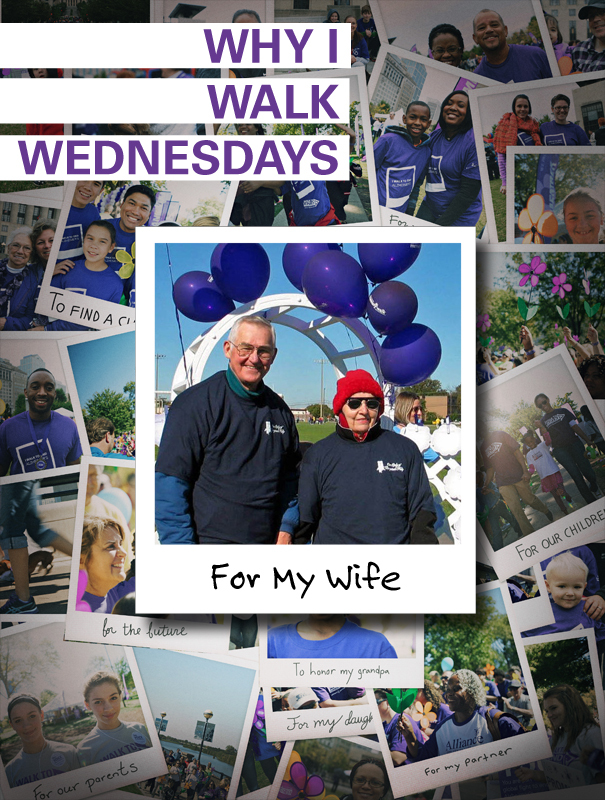 I walk to raise money to support the programs and services that the Alzheimer’s Association provides to families living with this disease. I walk to raise money for Alzheimer’s research, believing that one day we will have a method for prevention or cure for this disease. I walk for my children in the hopes that neither of them will lose a parent to this awful disease.